With the big trip to Alaska almost upon us it is time to think seriously about getting our planes ready to tackle the untamed wilderness of the frozen north. OK, so it isn’t that untamed anymore, and we at least hope it isn’t completely frozen by the time we get there, but well… you know what I mean. Tires come to mind first when we think of airplane set up for Alaska. The choices range from doing nothing to installing 31-inch-tall tundra tires. Since most of us are not willing to invest over $3,000 in a set of tires for one trip we will dismiss the tundra tire option, but they would allow you to land on some sand bars and some other very interesting off airport places if you were so inclined. The do-nothing option for the GlaStar trike means leaving 5.00×5 mains and 4.10×4 nosewheel tires on for the trip. The trip can be made with this way, but the nosewheel especially is not ideal for off-pavement landings. At the very least the nosewheel fairing should be removed, as should the main fairings. 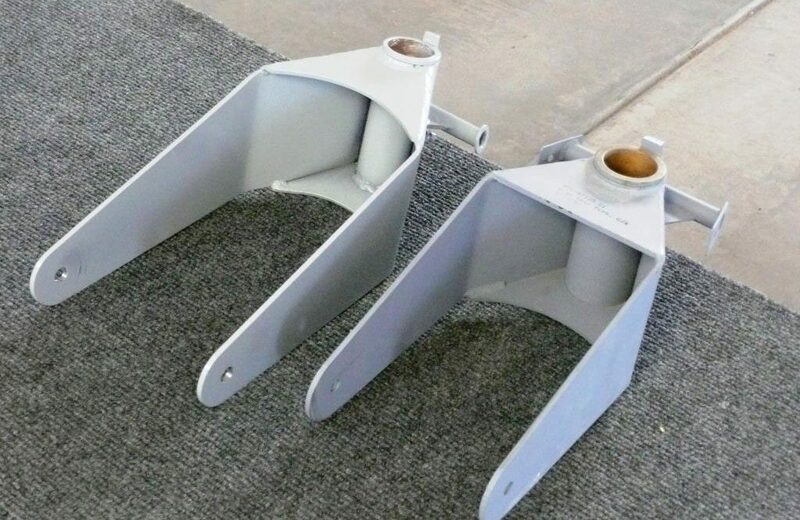 For a taildragger with 5.00×5 mains the same things apply – remove wheel fairings and be very careful with soft field landing technique to protect the tires and wheel. The larger wheels and tires of the Sportsman make it somewhat better suited for off-airport work as is. If you decide not to remove your nosewheel fairing for the trip, be sure to bring along some tools so you can remove the broken pieces along the way. If you have a GlaStar, going from 5.00×5 to 6.00×6 or larger mains is a bit of a production. You have to replace the brake flange, the brakes, the wheels, and the tires. If you have a trike you will also have to modify the nosewheel fork at a minimum to keep the plane level. You can simply add side plates to the nosewheel fork that will allow the axle to be dropped 1.5 to 2 inches and keep the 4.10×4 nosewheel. Or you can weld up a new fork to allow for a 5.00×5 nosewheel, which is a much better set-up. Les James did this to his GlaStar, and it came out quite nicely. This will give you 6.00×6 mains and 5.00×5 nose, a pretty good combination for the GlaStar trike. With the GlaStar TD you can easily go to 8.00×6 mains and take on even rougher terrain. 8.50×6 mains are also possible, but they are pretty heavy for the GlaStar unless you really need them. A bigger nose fork allows the use of a larger nosewheel on the GlaStar. The Sportsman already comes with 6 inch wheels, so going bigger on the mains is very easy. You just have to decide between 8.00s and 8.50s. The 8.50s are about 3 inches larger in diameter, but they also weigh over 6 pounds more per tire. With a Sportsman trike you once again have the problem of needing to drop the front axle to keep the plane level. I am doing this with aluminum side plates that are bolted on to the stock nosewheel fork, and then keeping the 5.00×5 tire on the front. With a 1.5 inch adjustment to the axle location I can keep the plane level with 8.00×6 mains. I also considered putting on a 6.00×6 nosewheel, but that was going to be more work than I had time to deal with before this trip. If you change tires don’t forget to redo your weight and balance calculations. Please also note that a 6-inch wheel and brake disc is two pounds heavier than a 5 inch wheel and brake disc. So why do we want to go to all this trouble anyway? The main reasons are propeller clearance and the ability to more easily roll over rocks and ruts. Prop clearance is a big concern especially on a trike. Do you have to do this? Certainly not, but prop blades are pretty expensive. Dave has so far completed three airplanes—a GlaStar, a Glasair Sportsman, and a Texas Sport Cub. He is currently building his second GlaStar, kit #5062. When he isn't building something, he shares his love of aviation with others by flying Young Eagles or volunteering as an EAA Technical Counselor. He is also an A&P mechanic, Designated Airworthiness Representative (DAR), and a member of the EAA Homebuilt Aircraft Council and a regular contributor at Kitplanes Magazine. I just purchased one and am excited to get a more grass-worthy trike.